There can’t be a more simple and delicious recipe than this easy taco soup. Keep a pound of ground beef in your freezer, five cans in your pantry and two seasoning packets and you can enjoy this hearty soup any time. It literally goes together in minutes and can be cooked in a variety of ways. If you have a little more time my Cincinnati Chili is another crowd-pleasing recipe. 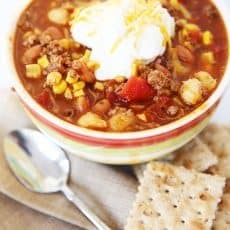 I am super partial to this easy slow cooker chili, but my husband thinks his George’s Chili (named after him) is the best ever. Here are the 5 cans. Keep them in your pantry and you are ready to make Taco Soup in minutes. People have asked if other beans like kidney beans or black beans may be substituted. Ranch style beans have a sauce that I think gives this soup extra flavor. 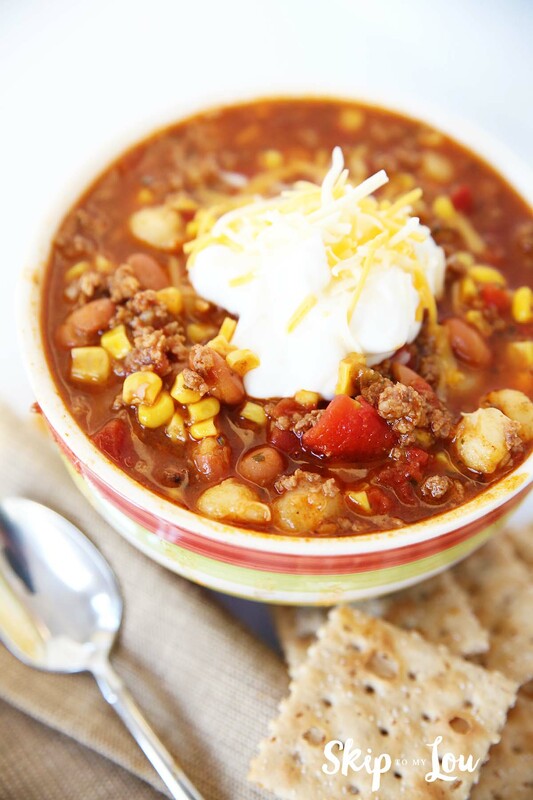 This Taco Soup recipe is made easily in one pot! It is hearty, tasty and full of flavor. Brown the ground beef (or lean ground turkey if you are decreasing saturated fat) in a large pot or dutch oven. Be sure to drain excess fat from the meat. Add in all the remaining ingredients and stir to combine everything and heat. It can be eaten just heated from the stove, left in a crock pot for hours or my personal favorite 10 mins in a pressure cooker. I call it my pressure cooker taco soup! Any way you cook it, it is a winner! Add a dollop of sour cream and some grated cheddar cheese for a super EASY and yummy soup! 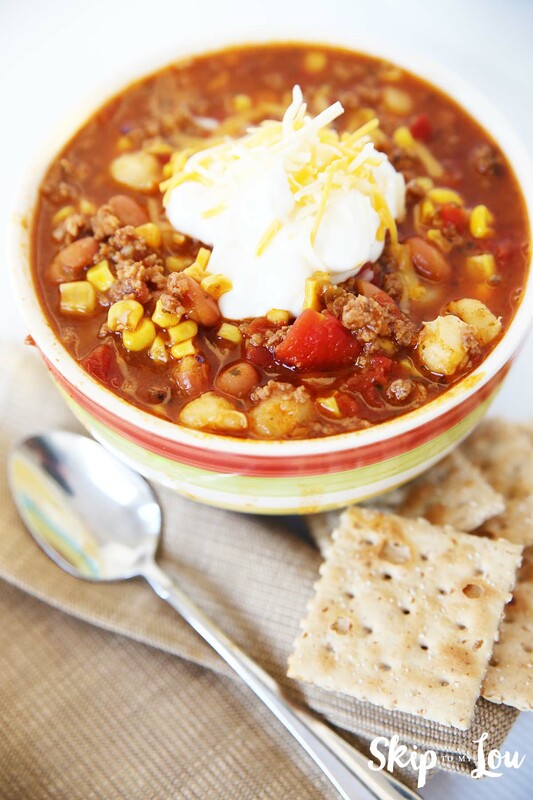 My kids love to crunch up tortilla chips or corn chips and stir them into the taco soup. This is a delicious protien packed soup with the meat beans corn tomatoes hominy. Keep all the staples in your pantry and you can have soup in minutes! This easy taco soup recipe makes for an easy weeknight meal or quick meal when company is coming and you don’t know what to fix. They will love it! 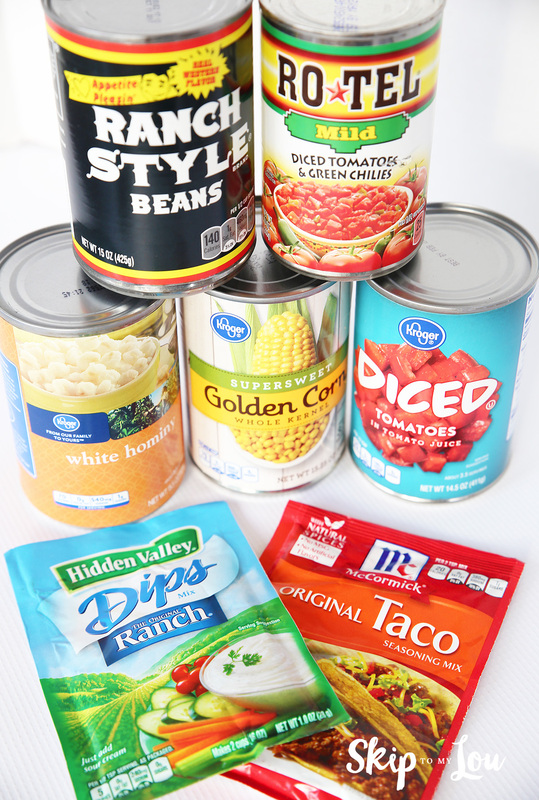 Keep these 5 cans in your pantry and you are always ready to make delicious taco soup in minutes! Combine everything and heat. It can be eaten just heated from the stove, left in a crock pot for hours or my personal favorite 10 mins in a pressure cooker. I call it my pressure cooker taco soup! Any way you cook it, it is a winner! Add a dollop of sour cream and some grated cheddar cheese and serve with corn chips for a super EASY and yummy soup! You might like these dinner ideas too! Southern Living doesn’t disappoint with Quick & Easy 5 Ingredient Supper ideas! Is there a substitute for ranch style beans? Hi Leona, I think you could substitute another kind of bean. Black beans would be tasty. Can I use something other than hominy? Hi Susan, You could use another can of corn or beans...... but the hominy is delicious. Have you tried it? I have to admit when my friend first made this soup for me (about 19 years ago) I hadn't ever had hominy. I really like it. Your Easy Taco Soup recipe looks amazing! Thanks for giving this recipe to us!